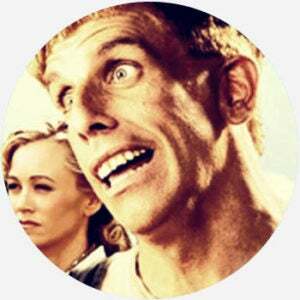 Simple Jack is a fictional character with intellectual disabilities within the comedy film Tropic Thunder. Cat on me, remote out of reach, forced to watch SIMPLE JACK... er, I mean, RADIO. Harold emerged from the lake Ward had dumped his body in and then staggered off towards the city. His mind seemed to be rebooting itself slowly so he spent the first portion of the episode acting remarkably similar to Ben Stiller’s “Simple Jack” character from Tropic Thunder. Where does Simple Jack come from? In the 2008 comedy Tropic Thunder, Ben Stiller plays a struggling action movie star, Tugg Speedman. Speedman previously played the role of a farm boy, named Jack, with intellectual disabilities in a movie called Simple Jack. Further mocking his simplemindedness, Simple Jack has a peculiar appearance, including a prominent overbite and ragged bowl haircut. The character and fictional film were apparently meant to parody other famous portrayals of persons with disabilities, such as Sean Penn in 2001’s I Am Sam or Cuba Gooding Jr. in 2003’s Radio. Shortly after the release of Tropic Thunder, viewers began to compare people or things to the character. Tweets from 2008 describe haircuts as resembling Simple Jack‘s and liken things seen as slow or stupid to him, including the Toyota Prius and Apple’s Genius music recommendation service. Outside of such topical comparisons and contemporary allusions to the character, Simple Jack is mainly discussed as part of the controversy it called. In response to the use of retard and the depiction of the Simple Jack character, disability advocacy groups, including the Special Olympics and the American Association of People with Disabilities, called for a boycott of Tropic Thunder. DreamWorks took down the trailer and promotional website and then met with the groups. A Tropic Thunder writer argued that the goal of Simple Jack was not to belittle people with disabilities but rather actors who “clumsily and terribly” portray those roles in easy bids for critical acclaim.